I like the peaceful feeling that comes when you have everything ready early for the holidays and you know you can relax and just enjoy being with your family. So at the risk of jumping the gun, we'd like to extend an offer to all you early birds out there to help you feel better knowing you've saved some money too. For any custom decorative charts completed by October 31, 2015, we are offering Buy One Get One Copy Free. It's the perfect holiday gift. 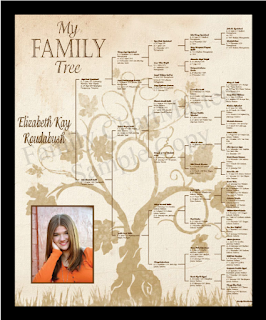 So check out our new gallery of chart ideas and then just send in any genealogy file and we'll get started on your family history chart early. We'll have plenty of time to work back and forth with you and make sure everything is perfect before we print. You can start the process with our free consultation and we'll get back with you with options on prices and sizes for what you are looking for. Ancestry users can start on our special Ancestry page. If you like to use FamilySearch we can download your information using our FamilySearch download page. We'll look forward to making your family the perfect chart. Get ready to impress your family members.